How do I report an electrical outage? How do I report an electrical outage? Note that you should check your breakers and fuses before reporting your outage. Occasionally, a tripped breaker or blown fuse causes the outage. How do I report a street light outage? How do I report a street light outage? When will my power be restored? When will my power be restored? When your power goes out, our crews will be working 24/7 to get the power back on. Power is restored to the most critical areas are first, like hospitals. Our crews then restore power in order of getting the most customers back on the fastest. Visit How We Restore Power to learn more. What if I have a medical emergency? What if I have a medical emergency? For any emergency, always call 911. In serious situations during extended power outages, if you use electrically powered life support equipment, you may need to seek medical assistance or relocate to a public shelter that has back-up power generation. During large-scale storm restoration efforts, our crews focus first on restoring service to operations affecting public safety, health, and to the largest groups of affected customers. What causes an outage? What causes an outage? Why can't you tell me why my power is out? Why can't you tell me why my power is out? As soon as we become aware of an outage, we dispatch a crew to identify the exact outage location. Due to the complexity of electric systems and the variety of causes for an outage, this process can take several minutes or, in extreme cases, several hours. Sometimes the cause of an outage is obvious. Sometimes it isn’t. As soon as we identify the problem and how long it will take to fix it, our dispatchers will send updates to our customer service center. What causes lights to flicker or momentary outages? What causes lights to flicker or momentary outages? It is not uncommon to see lights flicker during extreme heat, high winds, and thunderstorms. When your power flickers off for 1-30 seconds and comes back on, you are experiencing a momentary outage. Momentary outages happen for a reason and are designed to prevent outages that typically last one to two hours. The momentary interruptions are called trip and reclose (T&R) operations. When the lines are operating correctly, they sense a problem on the line, de-energize the line for a few seconds to allow the problem time to clear, then re-energize the line. If the problem does not clear, another T & R operation may occur. You may see up to three momentary outages in sequence. If the T & R operations are unsuccessful, the power will be interrupted, creating an outage. What are pole fires? What are pole fires? Pole fires occur when contamination from road spray, salt, etc., builds up on electrical equipment and combines with moisture from fog, rain, and/or drizzle. In the winter, salt contamination accumulates on poles and the insulators. When the first precipitation after the winter season is fog or mist and the insulators are still contaminated with salt residue, this creates an environment that allows electricity to track from the wire to the wooden pole, causing a fire. This electric current tracking often causes burning to occur near the top of the pole and the insulator. If the top hardware continues to burn, it can easily burn through the pole, causing the crossarm to tip over. Spring is the time of year we see most pole fires, due to road salt build up on electrical equipment during the winter months. The contamination generally washes off the equipment after heavy rains, so we don't see many pole fires at other times of the year. What if there are tree limbs on wires near my home? What if there are tree limbs on wires near my home? We perform maintenance trimming work around all pole-to-pole distribution and transmission electric lines. However, if you have an emergency situation such as a broken branch on an electric wire, please contact us at 800-895-4999, so that we can issue a service order if necessary. If the issue is from a pole to the house, please provide the representative with as much detail as possible. Our representatives can schedule a ‘line drop’ with a minimum advance notice of 48 hours. You will be responsible for trimming the trees from the pole to your home. 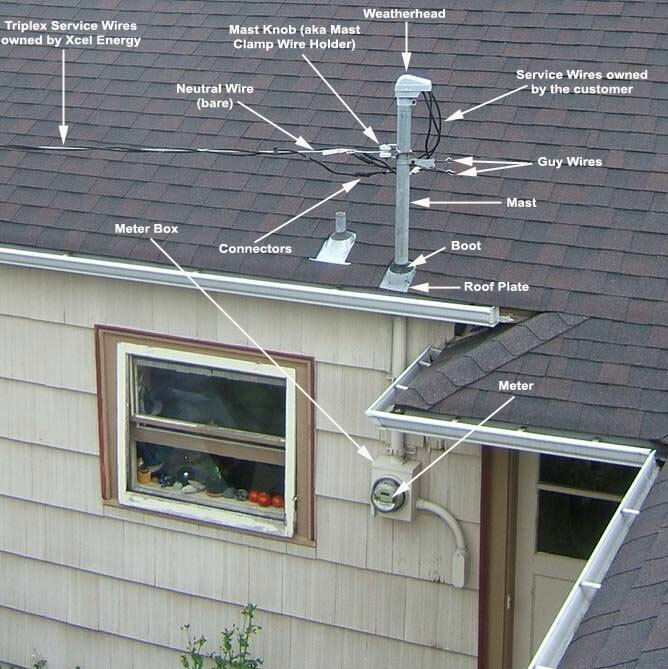 What if the electrical connection attached to my home is damaged? 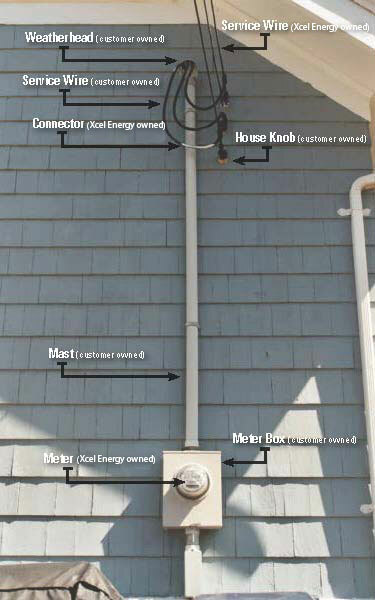 What if the electrical connection attached to my home is damaged? The electric service wires for your home run through a pipe - or mast - mounted to your house, and this may loosen or pull away during a storm. The mast will either be on your roof, or on the side of your home. If your mast has been damaged during a storm, you will need to contact an electrician for repairs before we can reconnect your service. It is possible that we may be able to provide you a temporary connection until your electrician can come out to fix it. For a temporary connection, your city may require an inspection. For more information on mast damage, head to our Mast Damage page.